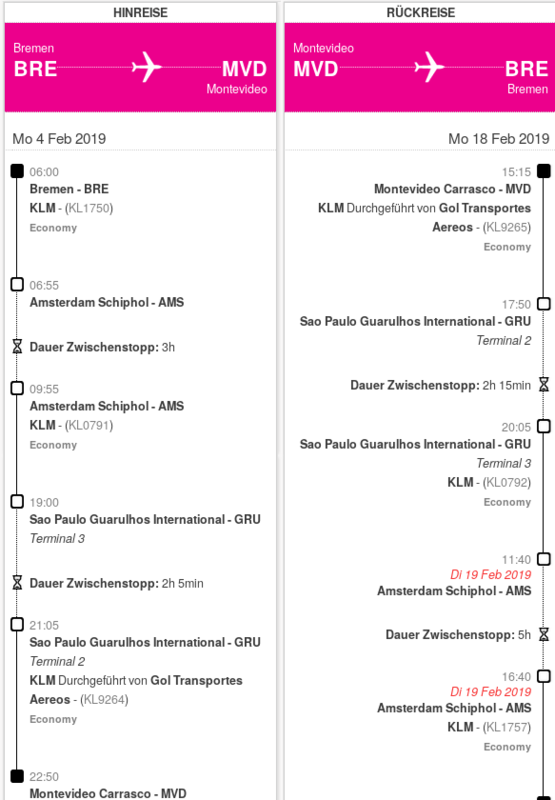 Are flights undertaken by GOL Transportes Aereos via KLM considered to be a single ticket / booking? I have booked tickets from Germany to Uruguay. The flight number is KL9264 which falls under KLM but I am anxious to know if this is a single ticket or not. Travelers transiting through Brazilian airports to other countries, whenever the onward flight is booked under a separate ticket and/or different code need to have a transit visa. Does the connection mentioned above constitute a Single ticket? As was the question previously asked On Expedia How Can I Tell if A Flight on Multiple Airlines is a single ticket or not, the accepted answer came only after the OP had traveled and not beforehand. This is clearly a single ticket. If you had separate tickets, the airline would not show them together (and the KL codeshare probably cannot be bought as a separate ticket at all). What Brazil is interested in is whether you'll need to go through their immigration control. When you're on a single ticket it means that you will not need to go through immigration to pick up and recheck baggage, and that you won't risk being stranded in Sao Paulo because your incoming flight was late and you missed your connection (or the second airline somehow didn't honor your ticket). I mentioned in the email that I wish to confirm whether the flight ticket booked is a single reservation/ticket and I received a prompt reply from them stating it is a single reservation with the exact code mentioned by them. The replies where within windows of the 6 hours, which was fantastic. different code refers to different PNR. If your ticket does not fall under the requriment of a transit visa then you should not have a problem. So as mentioned @HenningMakholm I do not require a Transit Visa. Not the answer you're looking for? Browse other questions tagged tickets transit-visas klm or ask your own question. Is it possible to skip the last destination of an international flight? Can I take an earlier Thalys train from Schiphol when travelling on a KLM flight-train ticket? How are connection complications on a single KLM+Kenya Airways itinerary handled? Dealing with a rogue immigration official?